Neycho Doychev ( D’Neycho) is born in Bulgaria on the 3rd of January 1950 in a military family. His father was very well known military general at that time. As a child he was growing up in an environment of very strict discipline and the stringent education system of the then communist regime. Since a very young age Neycho was discovering his artistic talent. After school finished he would spend hours sitting in the library reading lots of history and story books and afterwards he would go and start drawing about the most interesting story he read. When he turned 18 years he joined the military school on the insistence of his father. Soon he discovered that the military school was not for him. In 1972 D’Neycho, despite the pressure of the family to join the military school, subscribed for the Art University of Veliko Tarnovo. After 4 years he graduated the Faculty of Fine Art. In 1976 he won concourse where the first price was a six-month scholarship specialization of Fine art in the Art Academy of Bratislava, Slovakia. 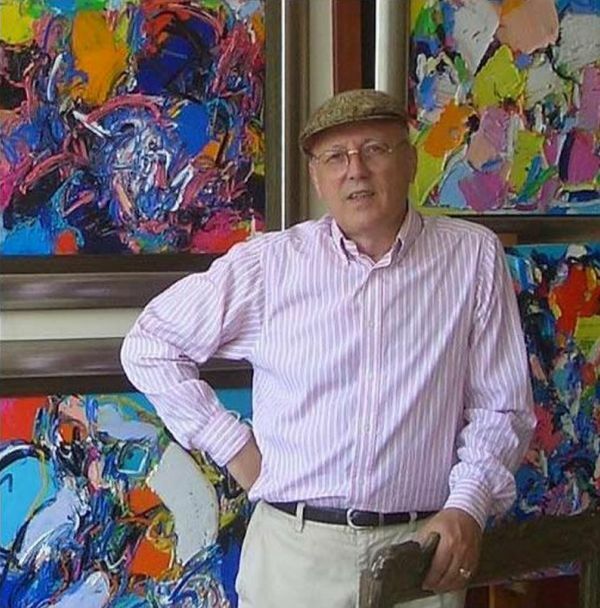 After his graduation in Bratislava he returned to Bulgaria and in 1977 he worked for one year as school art teacher until an opportunity in the City Art Museum in Bulgaria presented itself and he started as a curator. In this period he was also commissioned by the Bulgarian government to make frescos in style of social realism. This not only improved his financial situation but also provided D’Nechyo the ability to travel outside the country. He was making landscapes while living in different countries and at the same time he was participating in different exhibitions. In 1979 D’Neycho opened the doors of his own atelier combining his work at the City Art Museum with the life of an artist. During the first years of his career as an artist he was searching for his own style and methods through the paintings, he wanted to find his own visual style and the philosophy of his art. In the period between years 70’s and 80’s his art was marked by eclecticism of many techniques and styles – academic and socialist realism; impressionism and surrealism. In 1986 D’Neycho has his first a solo exhibition in Sofia and presents his artworks made in his own style. For this exhibition Dimitar Kazakov-Neron- is helping him who is a very well-known name in Bulgarian art. Neron wrote a summary for the catalogue of the exhibition with pseudonym “artist D’Neycho”. Since then Neycho uses this pseudonym as his artistic name. The exhibition is a great success and in the same year he becomes a member of the Union of Bulgarian Artists. In 1990, by that time already a well know artist himself, he becomes the Director of City Art Museum in Bulgaria. For two decades D’Neycho has been dividing his time between his activities as a Museum director and his work as an artist, spending every free minute in his atelier making artworks and participating in Solo and group exhibitions. In 2009 by the age of 60 D’Neycho retires from his Directors position and can fully focus all his time and energy on his own work.